EPIC The Irish Emigration Museum is one of Dublin’s newest museums and a stunning, exciting addition to the story of the Irish impact upon the wider world – centrally located besides the River Liffey in the venerable cellars of the chq Building. In the neighborhood of international businesses, but also just a few steps away from the Jeanie Johnston famine ship and the famine memorial. But just what will await you when you descend into the bowels of the converted warehouse? Certainly not a dusty museum, but a very immersive experience. Which took us by surprise. In a very positive way. Here is the crunch – EPIC The Irish Emigration Museum is one of the new breed of visitor attractions, which I would call a “virtual museum”. Taking some cues from the splendid Titanic Belfast, and providing a similar exciting use of modern technology to tell a story. Yes, basically the whole attraction is about storytelling, in this case mainly the story of Irish emigration, and what impact Irish migrants (and the Irish in general) had upon other countries. To achieve this, you won’t be facing artifacts (in fact, there are almost none, but the colorful convict uniform is a cracker). 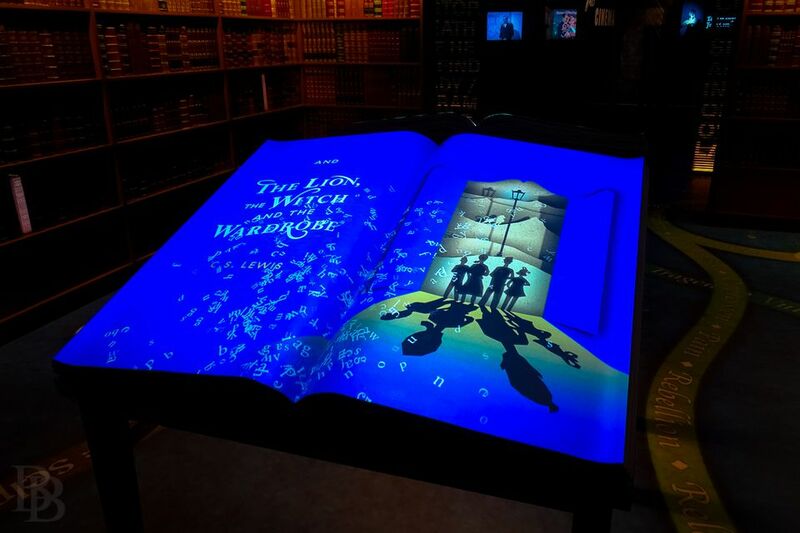 On the contrary – the story is being told, sometimes literally, through the eyes of those who lived through it, through the observations of others, and through at times highly interactive displays. Displays that have such a brilliant concept and quality that will make you forget that you are basically “playing with computers” in no time. In short: while most of the whole exhibition could be sold as a handy DVD, it certainly makes you linger, take part, get active. Yes, even I hopped from candidate to candidate in the rogues’ gallery of infamous Irish emigrants (including such diverse characters as Typhoid Mary, Ned Kelly, and the intrepid duo of Burke and Hare). Well, apart from the whole experience ranking as a new highlight of visitor attractions in Dublin … I am hard pressed to single out specific exhibits (which are all thematically grouped in separate rooms, the subterranean maze of which you meander through). The stunning display of modes of transport right at the start of the exhibition was great, though it may not be everybody’s cup of tea (I liked the stainless steel models representing everything from St. Brendan’s boat to modern jetliners, with the Titanic in-between). Then there were those emigrants telling their stories, the display almost three-dimensional, but without any special effects. Some of the clever uses of modern information technology were noteworthy, like those sporting symbols you placed on a blank display, and then used to “dial up” more information. As an avid reader I also felt really at home in the literature section … pity the books lining the walls were imitations, but pulling the odd one out and then being treated to a reading from the work really tickled my fancy. Here I hasten to add that we visited on a slow day, and there was no competition or resultant cacophony of readings – maybe picking an early time on a working day is the best idea. Is EPIC The Irish Emigration Museum Worth a Visit? Depends where your personal interests lie, I guess – if you want to find out about Irish history, and see loads of artifacts, you might be better off in the National Museums. They are free, they are stuffed full to the brim, they are conventional. And if you are in search of some light entertainment, EPIC The Irish Emigration Museum might again be too cerebral at times, an information overload despite the clever ways used to make this information palatable, attractive, easy to digest. The latter would also be my minor niggle as a historian … Dr. Che Guevara Lynch for instance comes over too sanitized, too “Isn’t it great he was Irish?”, there was Dr. Ernesto Guevara, the medic, and there was Che Guevara, the revolutionary, and both (I think) never used the Lynch maiden name of the mother. And his sketchy human rights record is not really mentioned … but as I say, it might be a minor niggle. Overall, we enjoyed the visit. Or, to be precise, we were simply blown away by the whole experience. Arriving with the idea of a quick walk-through for evaluation purposes, we spent an enjoyable two-and-a-half hours or so in the vaults. Which really was time well spent, as the visit is both entertaining and educational. And I have to add - the story of emigration never comes across as mawkish, trying to fish for sympathy. Facts are presented in a neutral way (where appropriate even in a fun way), you won't be asked to shed tears. Emigration is presented as what it was, or is - sometimes a choice, sometimes a necessity, in old times often a punishment. But the emphasis is on what impact this emigration had, what the Irish made out of it. So, all in all, it is quite an optimistic story EPIC The Irish Emigration Museum tells. Location: chq Building (Basement Cellars), Custom House Quay, Dublin 1. Parking: car parks are in the area and signposted. Opening Times: daily 10 AM to 6:45 PM, last entry is 5 PM. Admission Fees: adults 15 €, children (8-15) 7.50 €, concessions available. Estimated Time Needed: EPIC The Irish Emigration Museum’s website recommends 90 minutes, though if you want to see everything at a moderate pace this might be tight. Food & Drink: available in the chq Building. Souvenir Shop: located at the exit, with a good selection of quite attractive souvenirs. As is common in the travel industry, the writer was provided with complimentary entry for review purposes. While it has not influenced this review, About.com believes in full disclosure of all potential conflicts of interest. For more information, see our Ethics Policy.